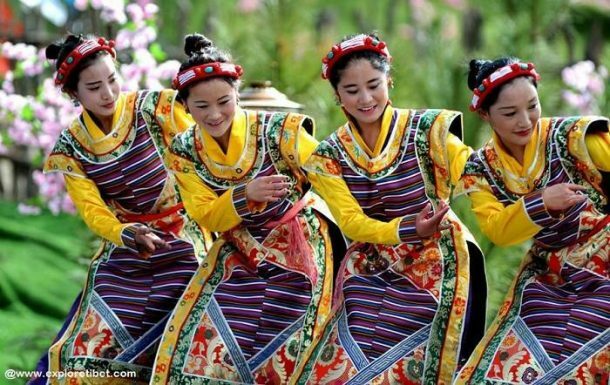 Around 400 kilometers to the east of Lhasa, in the Nyingchi Prefecture of Tibet Autonomous Region, one of the most beautiful festivals of the Tibetan calendar is about to begin. Nyingchi, unlike most of Tibet, is a land where trees and flowers grow in abundance, and where spring comes earlier than anywhere else in Tibet. While Lhasa, Ngari, Shannan, Nagqu, and Shigatse are still experiencing the cold of winter, down in the lower elevation of Nyingchi something amazing is starting to happen. 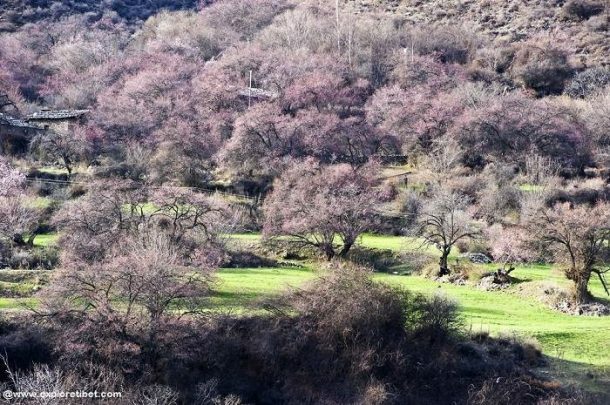 All across Nyingchi, there are peach trees, and as the winter turns to spring and the weather warms up in the beautiful alpine valleys, the trees all come out in blossom, covering the area with pink and peach and white flowers, as the trees bloom. 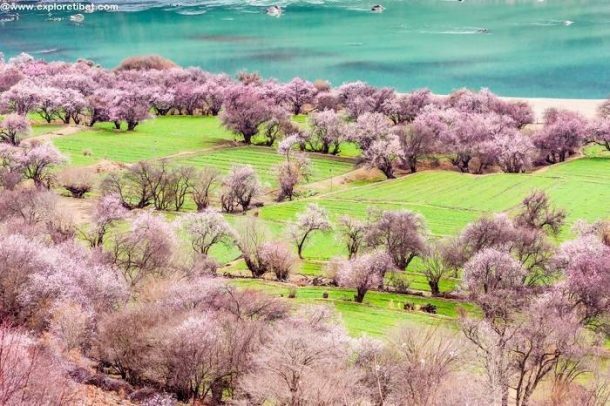 Often seen in the area as the harbinger of spring, the peach blossoms blanket the banks of the Yarlung Zangbo River with a backdrop of the high, snow-covered mountains. And for local Tibetans and many tourists, this is the opportunity to get out and enjoy the bounty of the land for a while, reveling in the new spring blooms, and celebrating new life and new hope for the coming year. When is the Peach Blossom Festival? Starting in mid to late March, the Nyingchi Peach Blossom festival extends for around 30 days, so if you are coming in April, you will still have the chance to see the peach trees in full blossom and attend some of the spectacular festivities in the area. The date of the festival changes from year to year, as it all hinges on when the peach trees start to blossom. Historically, this tends to be around the middle of March, although it has been later in years with an exceedingly harsh winter. For the festival in 2018, it is set to start on March 29. The weather during the festival is comfortable, and starting to get warmer, and because the average altitude of Nyingchi Prefecture is lower than the rest of Tibet, there is little chance of late snowfall or rain. Temperatures tend to hover around the 10-12 degrees mark, although the nights are still cold enough to freeze the ground and the morning dew. The Peach Blossom Festival began back in 2002 and has become a major festival for Tibetans from all over the region, as well as both Chinese and international tourists, who flock to the small prefecture to get a glimpse of this phenomenal sight. Hotels often book up fast on the run-up to the festival period, and you should really book well in advance if you are planning to travel there throughout April. The peach trees in Nyingchi are mainly situated along the banks of the Niyang River, along the road from Bayi Town towards the Nyingchi Mainling Airport and the surrounding valleys, and many other smaller valleys across the prefecture. Wild peach trees thrive in the Nyingchi climate and can be seen fringing fields, forming avenues along narrow roads and tracks, and on riversides in most valleys. The blossoms tend to start blooming first in Bome County, quickly followed by Zayu County, Mainling County, Nang County, Bayi District, and Gongbo’gyama County, which is normally the last area to see the blooms form on the trees. The Bome County peach blossoms are normally the first to bloom, and the best places to visit in the area are from Bome Town to Songzong Town, along the G318. Runa Village, which lies on the banks of the Yarlung Zangbo River, had hundreds of trees lining the riverbanks, while Qingduo Town, a little farther along, is home to thousands of wild peach trees, and the blossoming spreads across the valleys and hillsides around the town and the Qingduo Temple, making the area known as the “Peach Blossom Island”. Lying on in the lush river valley of the Yarlung Zangbo River, Mainling is like an oasis of wild peach trees that turn the entire area into a paradise of peach blossoms. The most beautiful blossoms in the entire area are often found at the entrance to the Yarlung Zangbo Grand Canyon, in Namjagbrawa, and walking through the vast fields of blossoms can make it feel like a fairy wonderland. Bright sunshine, blue skies, sparse white fluffy clouds, and the backdrop of the ever-present snow mountains makes it feel like a tranquil paradise all of your own. Located in Peach Blossom Valley, some 5kilometers south of Bayi Town, Gala Village is one of the most popular places for tourists during April, mainly due to the convenient location. Hundreds of peach trees grow in the wide valley, covering both sides as well as the valley floor, and are surrounded by lush green hills with a beautiful, shallow river running along its length. The village is often chosen to host the opening ceremonies of the Nyingchi Peach Blossom Festival and is a great place to visit if you are limited for time. There are plenty of things to do during the festival, with games and sports, as well as the chance to experience one of the most beautiful cultural festivals in the world. Photography competitions abound during the festival, with prizes and money for those who take the best photo of the peach blossoms. 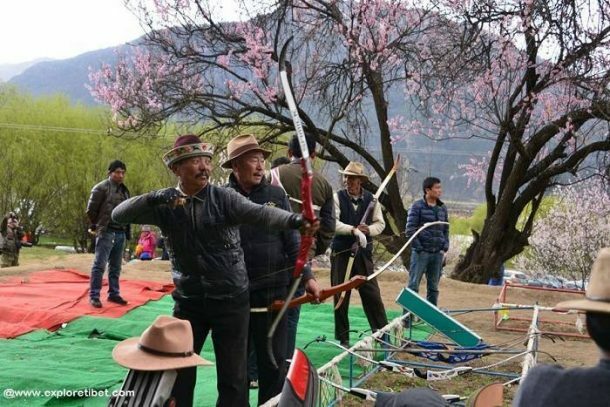 You can also try your hand at one of the many games and sports that take place during the festival, such as archery, horse racing, stone carrying, and wrestling, or join in with the locals in the dancing parties, and enjoy the fun and festivities, as well as the food. The easiest route by road is from Lhasa, the Tibetan capital, as Nyingchi lies on the G318 National Road, also known as the Sichuan Tibet Highway, around 400 kilometers east of Lhasa. It takes around 7-8 hours to travel the distance by road, and you will need your guide and driver to get there, as Nyingchi is still in the restricted travel area. You will also need the Military Permit, on top of your Tibet Travel Permit and Alien’s Travel Permit, as Nyingchi is classed as a militarily sensitive area. You can fly to Nyingchi from Lhasa in Tibet, or from several cities in mainland China, such as Chengdu, Chongqing, and Guangzhou, to Nyingchi Mainling Airport. Chengdu Shuangliu International Airport has four flights a day to Nyingchi, while Chongqing Jiangbei International Airport has two non-stop flights per day. Flights from other cities, such as Guangzhou, are less frequent. From Lhasa, there are several daily flights to Nyingchi, which is a stopover airport for flights to Chengdu and Xi’an from the Tibetan capital.